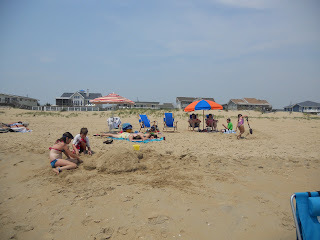 This past week we were invited by friends to join them and another family at their beach house south of Virginia Beach in Sandbridge. It was my first beach trip as a triathlete-in-training and it definitely played out differently than say....those pre-kid beach weeks. (Yeah, you know that kind of beach trip!). In addition to the family fun, I was excited to get in some swim/bike/runs in a different locale and flat venue. When the third family arrived (who we did not know previously), so did a well-maintained Trek roadbike belonging to the family dad, John. I was so excited because I'd brought Ace (the Jamis roadbike). It turned out John is also a triathlete! As soon as we were all unloaded, out came his computer to plot a ride. We were on for a ride the following morning. Heading out for our first ride! 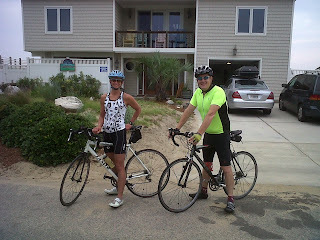 We did a nice 40 mile ride and were surprised at the large number of cyclists out there. We saw two big pelotons and tried mightily to catch them. John was clearly the stronger cyclist and I rode harder than I would have alone. It was a different kind of workout than I am used to in my Blue Ridge Mountains, with no letup on the flat terrain. I repeated the loop with him again two days later. Here's where some of that happened! I did a progression run and an aerobic run. One was at 6:00 am and the other was at 5:30 pm. One I enjoyed, the other I did not. One I had wings, the other I had concrete shoes. I am not accustomed to high heat and humidity. One really cool thing is I saw a fox crossing the road! 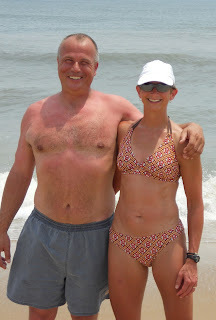 Coach Jim suggested I try an ocean swim, parallel to the shore, which I had never done before. 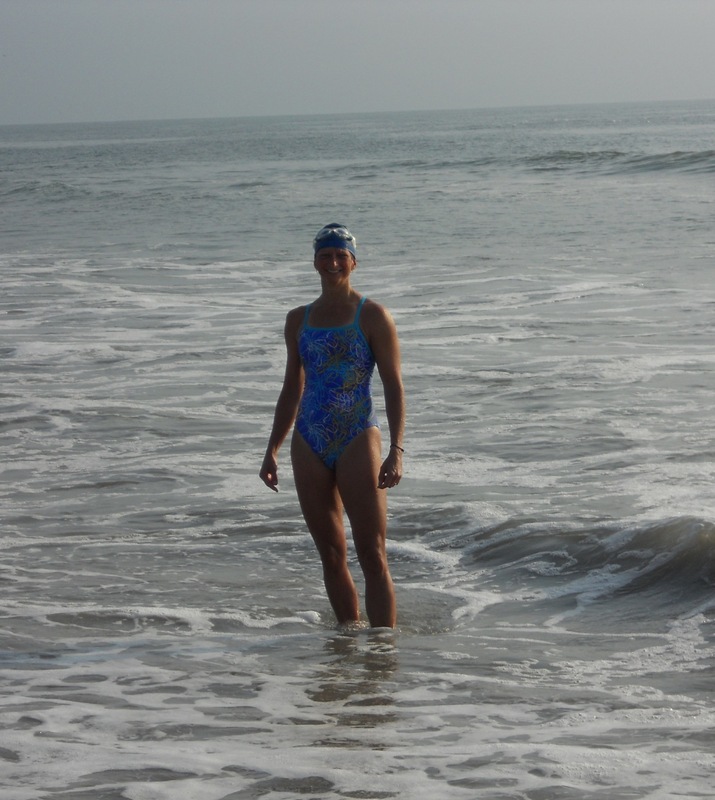 My ocean experience is limited to bobbing in the waves, so to swim out beyond the breakers was a bit scary. (No one thinks they will really be eaten by a shark but it does happen....sure didn't want it to be me) My first attempt was on Monday. 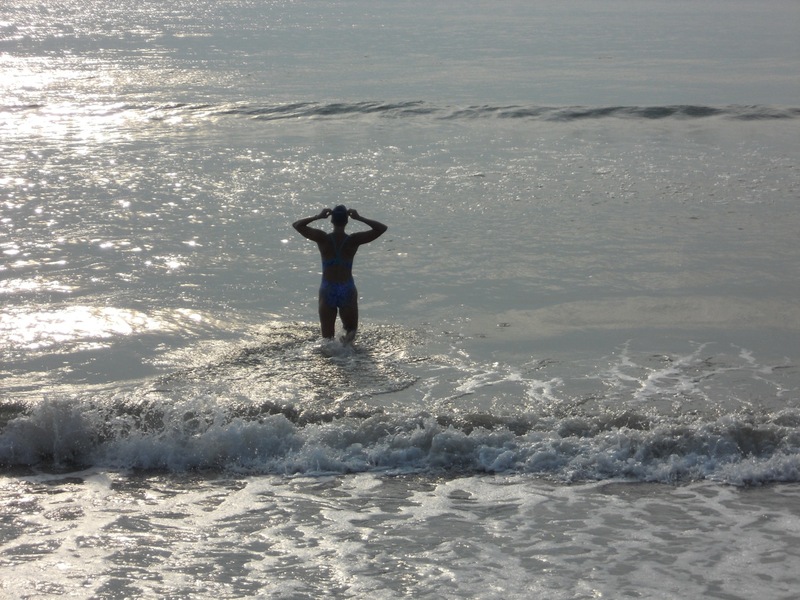 It was a short 15-minute continuous swim but I couldn't shake thoughts of sea creatures and the alone-ness of it all. I felt very small! 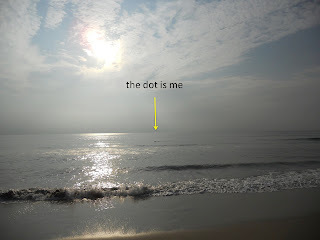 I hadn't been able to convince anyone to go with me so I swam just behind a line of surfers and Robert tracked me from the shore. I enjoyed the actual swimming part but I would have been much more relaxed with another swimmer or kayaker. 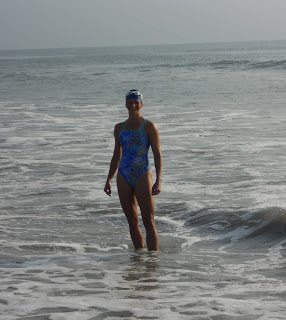 I went back out Tuesday morning after my run for swim #2. 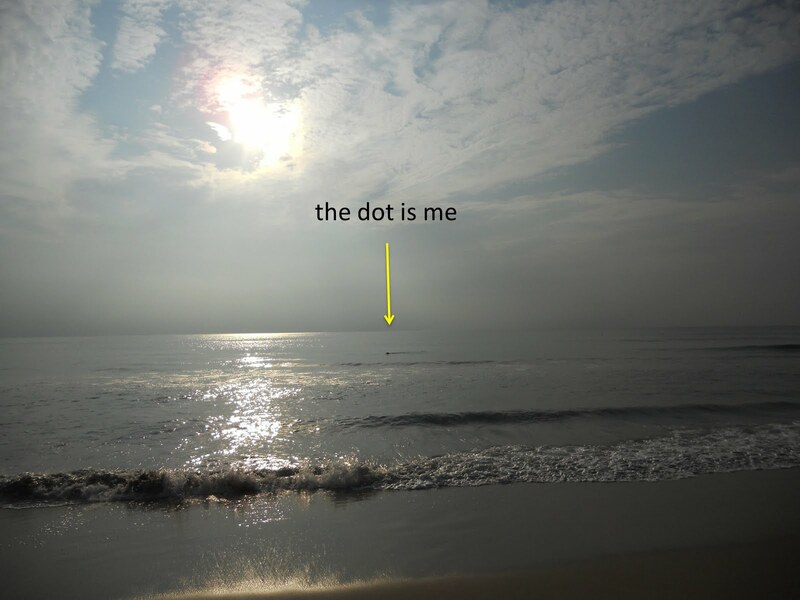 The ocean was warm and calm and there wasn't a person in the water that I could see, north or south. Robert again was the lifeguard and photographer. This time I almost relished the solitude. Yes, I know swimming alone is not the wisest thing but oh well, I survived, and WHAT a treat, what a memory. It looks further out than it really is. I could almost touch the bottom. 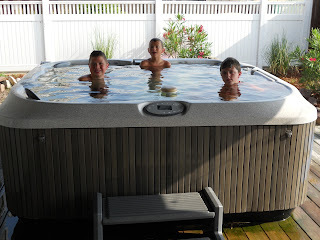 I have to say it was nice to recover in the hot tub. That is, when the kids would let me in. We were only there for 72 hours, but most of the workout stuff was done in the early hours before the kids were fully awake. That left the rest of the day for fun with family and friends. For more on that, see the family blog. I'm back home, with no travel expected until the August races.